Did you know that ancient people thought the red dust from Mars’ surface was blood from warriors fighting each other? Mars is the fourth planet from the sun and the best possibility that people might be able to live on a different planet. It was named after the Roman God of War because of the red dust on Mars. 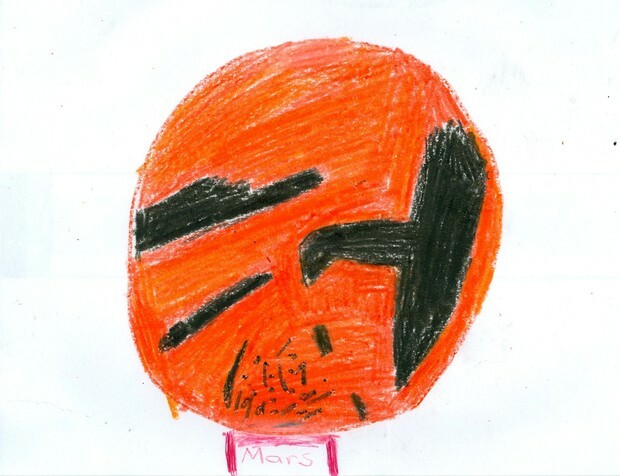 Mars looks like a big, red disk in the sky. Many people and astronomers thought that Earth and Mars had many similarities. In 1659, Christiaan Huygens discovered that Mars rotates or spins on an axis just like Earth. The day on Mars is roughly the same length of an Earth day. A Mars day is 24 Earth hours and 37.5 Earth minutes. In the 1700’s, another astronomer named William Herschel had seen the ice caps at the north pole and the south pole of Mars. Giovanni Schiaparelli made an interesting find. He saw long straight lines on Mars’ surface. He called them canali which means canals or channels. Meanwhile, astronomer Asph Hall discovered Mars’ two moons. They were called Phobos and Deimos which mean fear and panic. As more was being discovered about Mars by scientists and astronomers, they understood more and more about the planet. Scientists wanted to send rovers and probes so they could learn even more about Mars. They wanted to find out if there was any life on Mars because there were many similarities between Earth and Mars. In 1965, Mariner 4 landed on Mars in mid-July. It had equipment that could take pictures of Mars’ surface. But the pictures showed no sign of life. Mars was a lifeless planet. While Mariner 4 was exploring Mars, scientist sent up another probe called Mariner 9 in 1971. Mariner 9 used its tools to find out more about Mars. It took pictures of a giant dust storm raging around the planet. When the dust storm stopped, it discovered volcanoes. The biggest and tallest volcano in the solar system is Olympus Mons. Mariner 9 found out that Mars has an atmosphere, but it has very thin gasses. Most of the gas is carbon dioxide, which is one of the gasses we breathe. Mariner 9 made the most exciting discovery of all. When the probe was orbiting Mars, it found channels. The channels were once filled with water but it dried out. If there was water on Mars, could there be life? In 1976, two more probes were sent to Mars. But these was not the probes scientists used in 1971. These were probes sent to search for life on Mars. The probes were big and they were shaped like a laboratory. The probes were called Viking 1 and Viking 2. These probes took examples of the soil, rocks, atmosphere, and the surface of Mars. But the Vikings proved very little about life on Mars. Scientists tried one more time and they sent up another space probe to find out about Mars. In 1996 Mars pathfinder was launched to discover Mars. It only reached Mars in 1997. But Mars Pathfinder was not sent up there alone. It carried a second robot called Sonjourner which means “traveler”. As soon as Pathfinder touched down, it sent Sonjourner to discover more about the planet. Scientists chose a place called Ares Vallis to land pathfinder. But it is not a random place, it was once flooded with streams and rivers and Sonjourner can collect rocks without going too far. Still in the future scientist will still wonder about Mars. Very much has been discovered about Mars, but there might be so many things to discover about our red neighbor.